Does the trough remain open or does it deepen. Does the speed of the system change, with any potential slowdown. Does the cold front have colder than expected temperatures. Here's a brief update to these factors. 1) The trough remains open, although with slight deepening on the ECM and it's members. 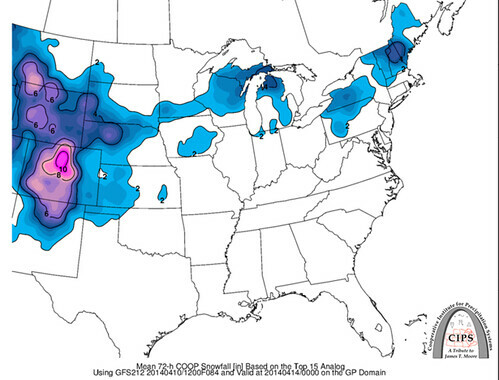 GFS and GEM deterministics and ensembles are similar in depth to previous runs in terms of strength. Currently the trough is a closed low off the California coast, that will open as it moves onshore and over the Rockies. An additional question mark to add at this point is the amount of surface troughing as a result of the system moving off the Rockies onto the Front Range and Plains. As that system "stretches" out on this side of the Divide it can add enhanced energy to the system to provide higher than forecast snowfall/rainfall totals. This will be best determined when the system is actually over land, interacting with the mountainous west. A slower solution, to be pointed out in 2), will only help facilitate surface troughing and thus higher snowfall/rainfall. 2) The speed of the system has changed in ECM and GEM. The trough axis is slowest on ECM and doesn't clear our region until Monday morning. A longer period of precipitation has developed in the ECM, and to an extent in the GEM. These two globals are the highest snowfall producing models as a result. The speed with the GFS trough has not substantially changed. 3) The associated cold front has indeed changed impact. Sunday's high will likely be at 12:00am, with a substantial and continuous drop throughout the day. Sunday afternoon will be 30s and 20s by the evening. With this rapid cooling, rain will change to snowfall in all areas. How much rainfall versus snowfall can't accurately modeled at this timeâ€¦ there are still 3 days for speed of the trough and cold air to change. The speed at which that cold air arrives will affect the column and could cool it quickly enough that snow will develop early and therefore produce a higher total. At this moment it sure looks like a storm that you'll want to plan for in a few respects. First, if you want to fertilize, go ahead and do that Saturday while it's still warm out and it'll be ready for Sunday's moisture -- rain and snow. Sunday travel through elevations of 6,000feet and higher will become slick and slow. Below 6,000feet will likely have a rain/snow mix with slushing possible later in the day as temperatures drop. In areas of heavy snowfall, keep an eye on your trees (not many have budded and leafed, but branches will be vulnerable to heavy snow). Also, track that cold air as it settles into the 20s for Monday morning. . . any lingering moisture could make your Monday morning commute slower than normal. We'll have additional updates as necessary as we head into the weekend, and keep you posted as this storm continues to develop.